Every Thursday through out the summer, you will be able to arrive and ride at Champions Flattrack School. No booking needed, we will be and waiting for you. we be open from 11 am to 4 pm. 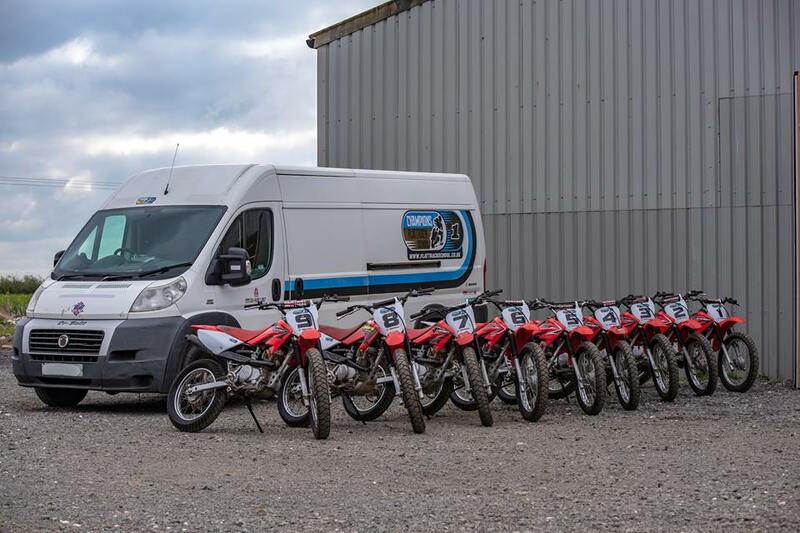 You can hire one of our CRF100’s or you can bring you own bike,( CRF100,110,125,TTR 125,DRZ125,PW 50,80 100 KTM 50). Price is £25 u16, £35 Adult. Bike hire is £35 U16 or £45 Adult. 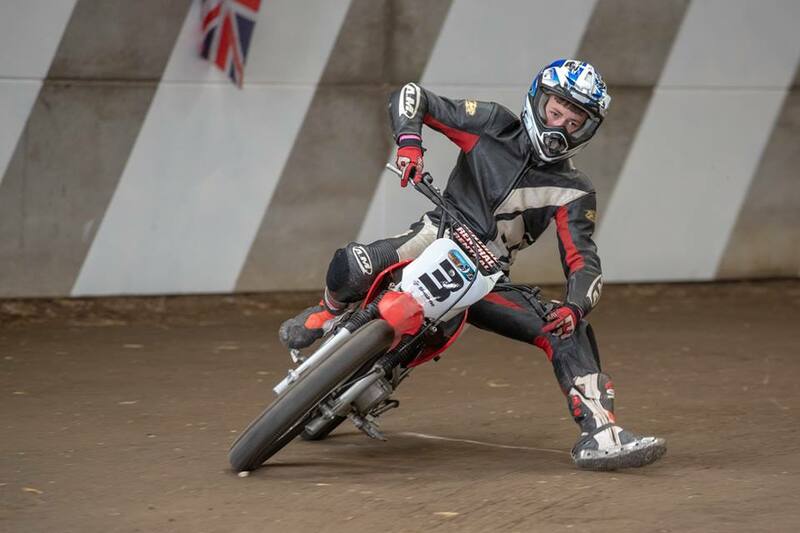 Pro Class, Franco Bourne and Jack Bell had some fantastic scraps in there races but it was Franco who got the better of Jack to take the end result of a win with Jack and some good rides by Steve Gunhill to take 3rd spot. Inter Class, was not so clear cut with three riders,taking wins in the classes, Lee Hutchinson ended up on third spot of Podium,Ben Shuttlewood rode well to take 2nd spot and winner was Simon Gugsy Gray with some brillaint rides. Rookie winner was Giovanni Beliossi who made the long trip up from London. 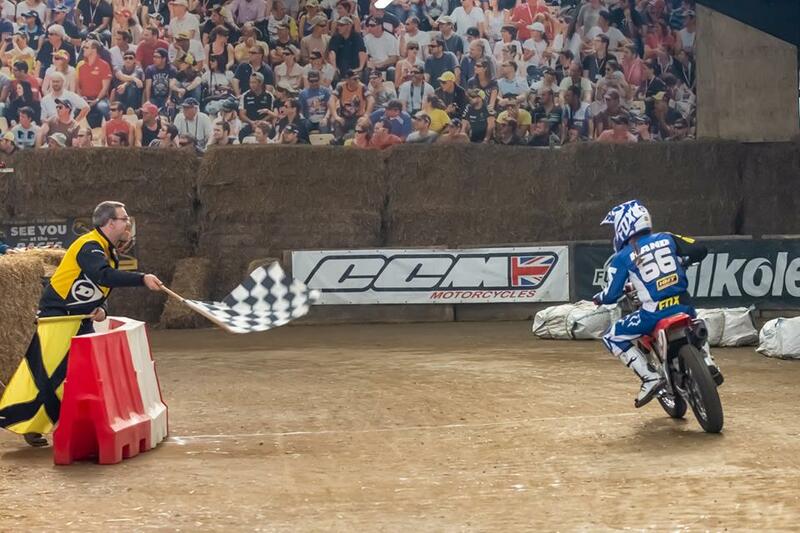 Youth Inters, Was Clean sweep for Wyatt Hopkins with wins in all is races but Kylan Shuttlewood got stronger and faster as the meeting went on and gave Wyatt battle towards the end. Cadets win went to Elliot Tuplin who for time on track was a real star and rode brill. Bike Hire Available, please email or call to book bike. 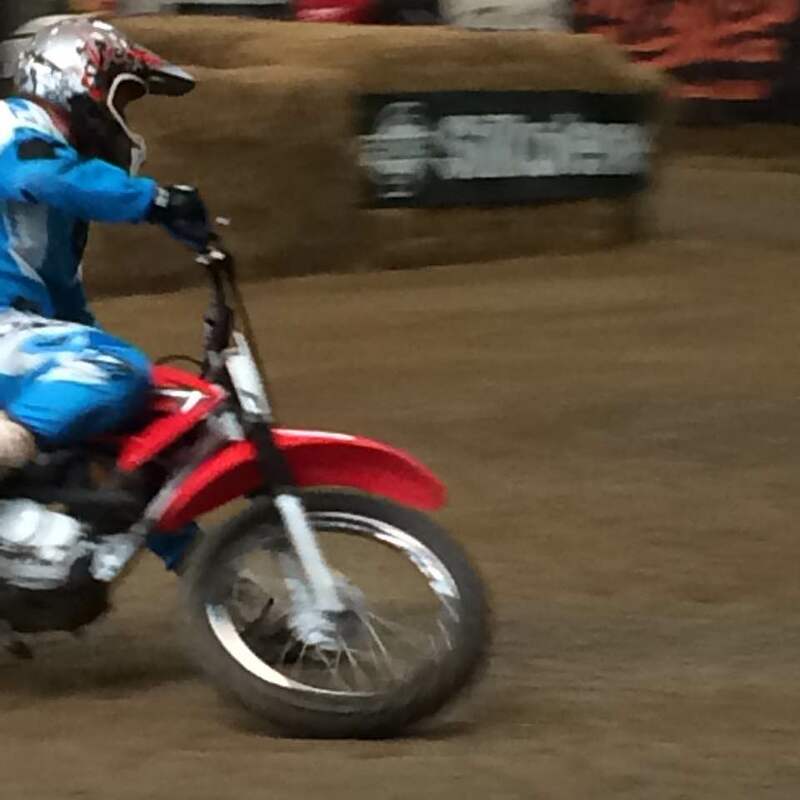 March race day at Champions Flattrack School Indoor Venue report. 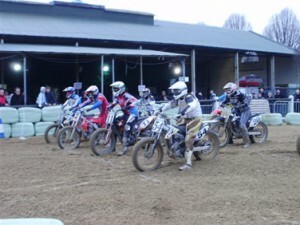 Not biggest turn out riders we’ve had at our race day but some best racing action took place in all six class’s. Pro Class, Franco Bourne took a clean sweep winning all 6 races but he still had tough Job of holding Jack Bell who never stopped trying to to get better of Franco. 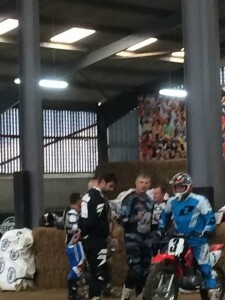 Steve Gurnhill got third spot on new bike that took bit getting grips. Inter Class. 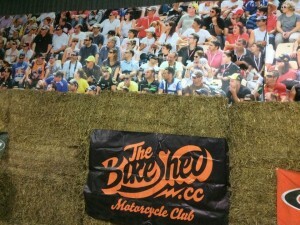 The largest Class of the day,had no less than 7 different riders taken wins over 12 heat races. It was Lee Hutchinson that took top spot from Ben Pinball Shuttlewood, and third third spot to TT racer Richard Wilson. Rookie Class, Going into TT track after three races every rider was equal on points ,So it was down to who was the best TT rider. Senior youth, It was anther daul with Franco and Jack,lots passing took place over 6 races and Jack did take win of franco but it was Franco ended up on top and not to fare behined the pair was Katie Hands. Inter Youth, Wyatt Hopkins was the kiddy on top form taking 6 out 6 wins ,the battles was great with Wilbur Skipp,Kylan Shuttlewood and Oscar Osbourne Wilkes trading places ever race. Great turn out for february race day, despite the snowy and very cold weather at Indoor Flattrack,with Oval and TT track in one day. 4 different winners over the 6 races,that was how close the Pro Class was,Tom Laycock,Kier Armstrong,Jack Bell and Franco Bourne all had wins but it was Jack Bell that took top spot backing up his win with sime good 2nd and third spots. Large class of inter adults, that brought out some very tough and hard racing at times.Steve Wilkinson pulled of the results to take the win. 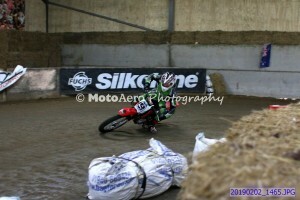 Former European Superstock rider was Second Maxime Cudeville and Star Classic racer was in third Joe Barton. Phil Addison had 5 wins and 2nd to prove he was worthy winner, Some real close racing for second spot Italian rider Riccardo and lincolns Carlos Stone which was joint result. Great racing took place in youth Senior, all six riders was in mix for top spot but it was Charlie Atkins who proved to be tough one after taking couple knocks and still came out on top[ and the same for Franco Bourne who had to sit on out with hand injury but still got back to take second spot. Good field of youth Inters this month.It was Charlie Kelly who really did ride well this time and making good improvement took top spot. One top runners Kylan Shuttle wood took a knock in heat 5 but pleased to say nothing broken and sure be fitting fit for next time. Alfie and Jack battle through out all the races. but Boy Jack that got number 1 spot. Big thanks to all that helped and marshalled,Ryan,Adam,Lee,Woody,Geoff,Geoff H,Micheal H,Ian. Next race day is 2nd March and we will be running one in April as well the 6th. The above dates are now on the ‘Courses and Prices’ page for you to book on. Inter Class, Was won by Monster Energy rider Reuban Ward with 5 wins and 2nd.It was tough battle for second spot between Tom Moore and Lee Hutchinson but Tom just got better of Lee by 2points. 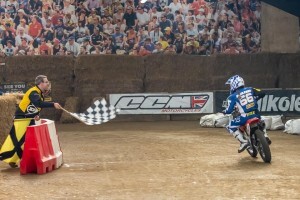 Rookies, Was clean sweep to Newcomer Matt Bolosover with 6 Wins and 2 of them he won after crashing! Phillip Addison a fine second and Justin Waddington who was on vaction in UK all way from South Africa. Senior Youth,Franco Bourne and Jack Bell both had three wins a piece but on count back Franco was declard the winner and third spot went to newcomer Fenton Seabrighton. 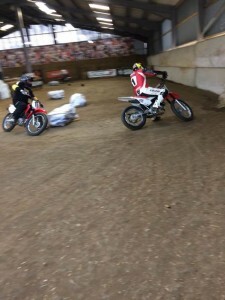 Inter Youth, Great battles took place with two boys on Hondas and Two riders on KTMS.It was Honda boys that came out on top win going to Kylan Shuttlewood with three wins. Next Open practice is 19th Jan and next race day is is 2nd February and don’t forget School and we open for private bookings 6 days a week. 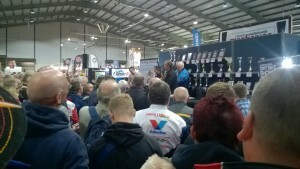 Just Say big thankyou to Helpers, Geoff,Geoff,Chris, Glyn ,Ryan,Jackie and our Sponsors Hagon and Silkolene. Scipspics shared an album: Champions Flattrack School – 03/11/18 toChampions Flattrack School‘s timeline. A few photos from todays events…. Struggling with the lack of light…. New for winter 18/19 will be our monthly race training days, held on the first Saturday of the month, from November to February inc. at our indoor track. 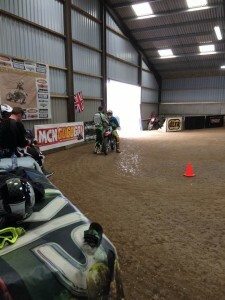 It will be great race training for the season ahead, with ACU approved instructors on hand. There will be practice and 3 races on an oval track, followed by further practice and 3 races on a TT track, with a combined overall result to decide the winners. 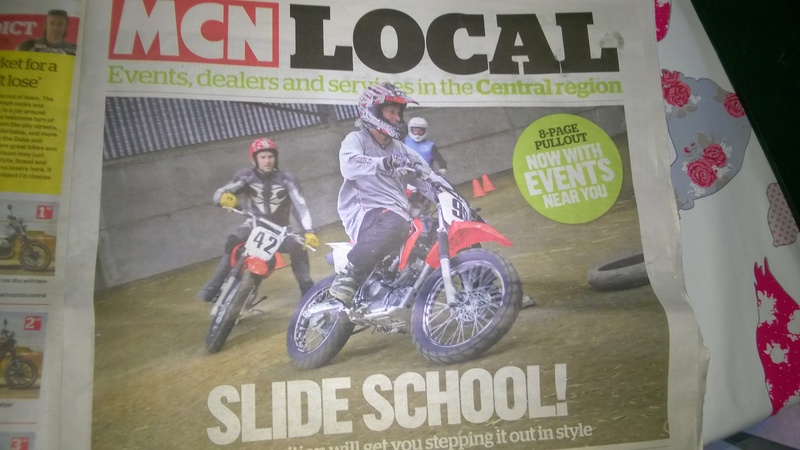 Youth Inters – 9-12 yrs, up to 110 cc four stokes only. Youth Seniors – 13-15 yrs, up 125 cc four strokes only. Sat 3rd November, Sat 1st December, Sat 5th January, Sat 2nd February. Sign on will be on the day and will open at 9.30 am and close at 10.45 am. (any one later than 10.45 will not get a ride). Practice will start at 11am. No pre-booking required, please register your interest on the events listings a week before each event, thank you. Please scroll down for full listings. Wed 10th Oct, Level 1 Week Day Offer £120. Open for single or group bookings, 10% discount if you book 4 or more places , ideal for novice riders. 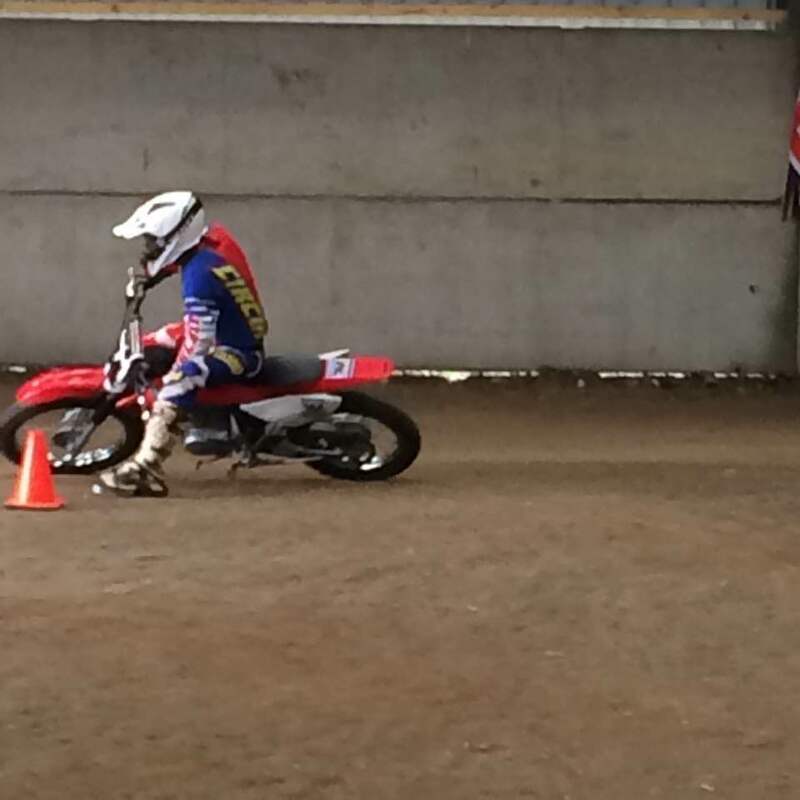 Full days Training from learning the technique to riding full Oval and TT tracks. Lunch Included. Sat 13th Oct, Open training Session, Adults and U16’s, from Pro to Beginners. If you have your own bike then only it’s £35 for the day, £25 for under 16’s. With bike hire it’s an additional £50 for Adults, £30 U16’s. Sat 20th Oct, Level 1 Course Open for single or group bookings, 10% discount if you book 4 or more places , ideal for novice riders. 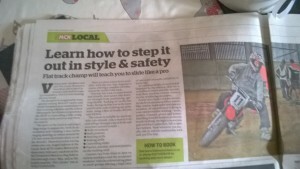 Full days Training from learning the technique to riding full Oval and TT tracks. Lunch Included.£159pp. Adults and U16’s, from Pro to Beginners. Ride from 1pm ’till 4pm. 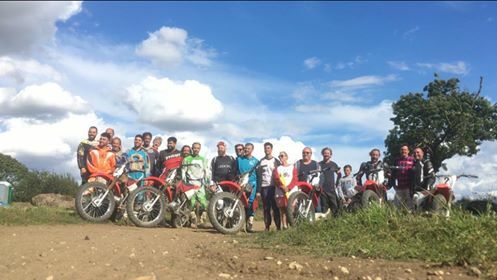 Sat 27th Oct, Level 1 Course Open for single or group bookings, 10% discount if you book 4 or more places , ideal for novice riders. Full days Training from learning the technique to riding full Oval and TT tracks. Lunch Included. £159pp. 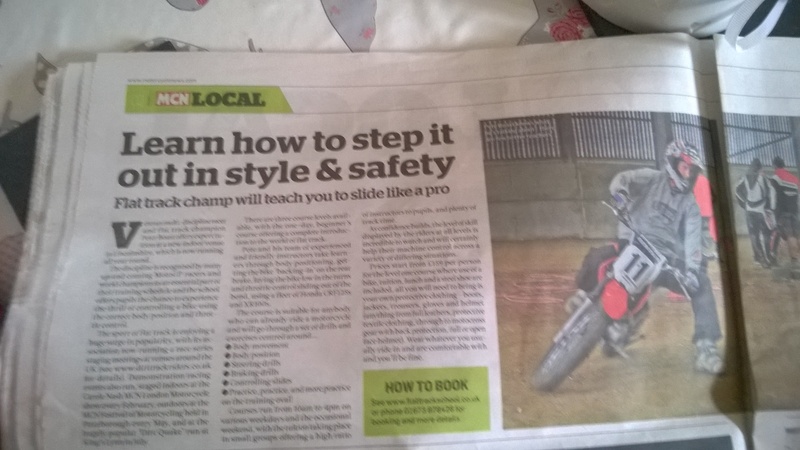 Sat 10th November, Level 2 CourseFor people who have mastered level 1 or who currently ride flattrack at rookie level. Includes all instruction, supply of fully fueled and prepped Flat Track Motorcycles, refreshments and the all important steel shoe. You provide your own clothing, boots and helmet. 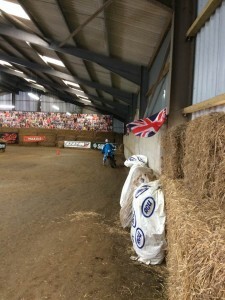 Runs at TCR, just outside Market Rasen, Lincs., where we have the indoor and outdoor tracks. Please call on 01507 313590 or email peter.boast1@btinternet.com to book in for a level 2 course, as we need to ensure that you are ready to progress from level 1 or that you have other suitable experience i.e. 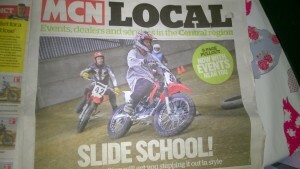 you already race novice flattrack. 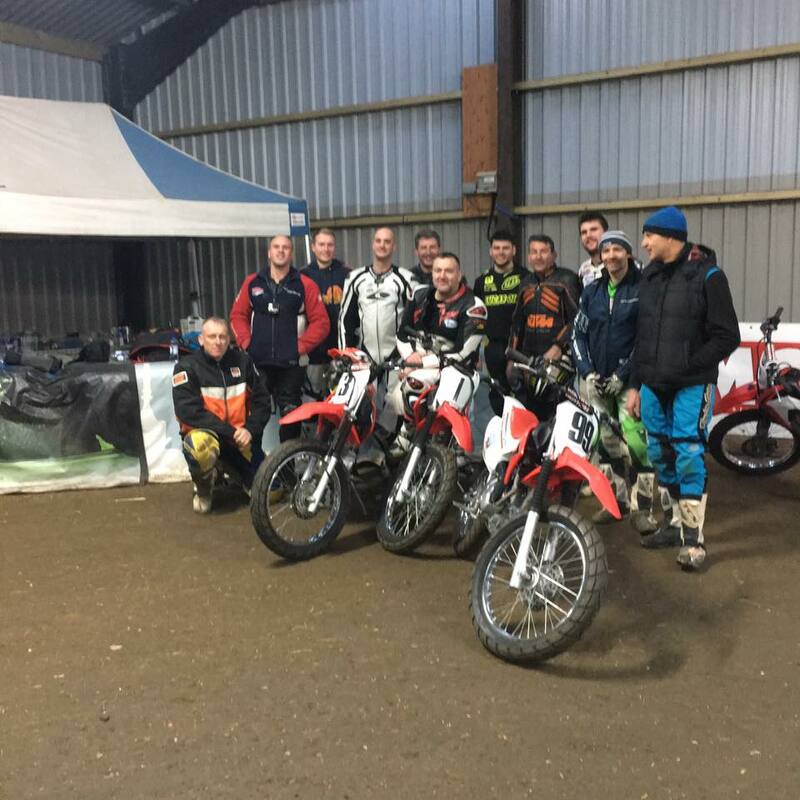 Sat 14th November, Level 1 Course Open for single or group bookings, 10% discount if you book 4 or more places , ideal for novice riders. 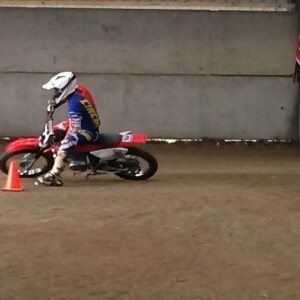 Full days Training from learning the technique to riding full Oval and TT tracks. Lunch Included. £159pp. Sorry everyone but we’ve had to cancel the summer evening practice sessions due to new planning restrictions but will try to programme some for any free Saturdays we have, see above . 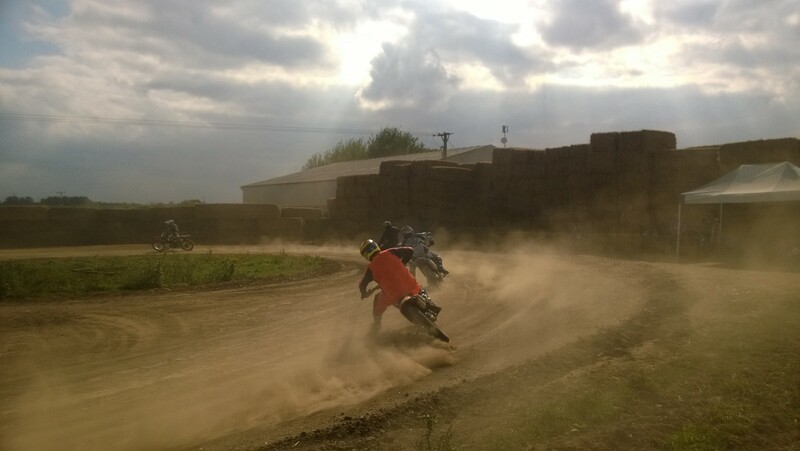 Hoping to get the evening sessions sorted in time for our popular winter evenings so please check back then, unless of course you can make the Saturdays….. Flattrack schools will still run as per the dates on the website. Thanks. 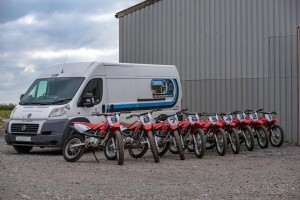 Bikes permited are….Crf 100,110,125,FTR 225,Drz 125,TTR 100,125,Kx110f. Please see courses/prices pages for further info. 6/8/17 We had a great day on the Level 2 course at the weekend, with a great bunch of lads. We rode indoors in the morning working with on board cameras, and on practice starts and race tactics, every one made good progress. Then we moved out side on the big oval and TT track for mega fun and racing. Well done to every who attended the day.Thanks Glyn and Marsh for instructing. To book please visit the booking page or call the office on 01507 313590. 1/3/17 Flattrack action at the Dublin Motorcycle Show this weekend.we will also be there School bikes offering Irish chance to sample bit taster of our School. Dave Aldana and Gene Romero at Stafford. I had a really good ‘On Any Sunday’ Weekend, as I got to see and chat with the stars of American Flattrack at that time – Dave Aldana and Gene Remero at Stafford. 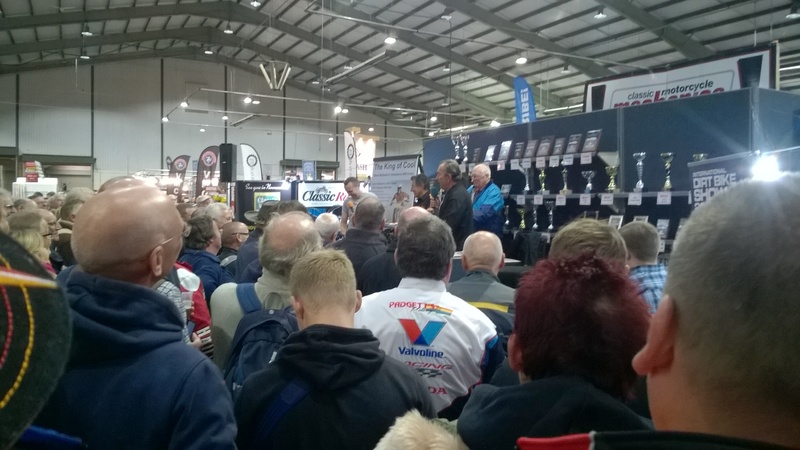 There were great interviews with Steve Plater and well done to Malc Wheeler for getting the boys over – Brilliant! Yesterday’s Champions Flattrack School, just proved how important it was for us to be indoors as it poured down outside and means we can continue to run our schools and our new open practice training sessions right through the winter months.